An international investment company with more than 20 years' experience of working with clients to fund and deliver major developments has been chosen as the private sector partner for the council's new joint venture company DeliverSK. The Leader of South Kesteven District Council, Councillor Matthew Lee, today announced that IAG is the council's partner for DeliverSK. DeliverSK will create a pipeline of development and regeneration projects and take them from the concept stage through to completion. IAG was founded in 2000 to provide services to funds and other corporate finance structures and currently acts for entities with assets totaling approximately £12 billion. IAG works in a variety of sectors, with a particular focus on property and development in the UK, including care homes, leisure facilities, primary care facilities, offices and shopping centres. Councillor Lee made the announcement this morning at a Business Breakfast at New College Stamford to more than 80 local business people, hosted by the council's economic growth and regeneration company InvestSK. He said: "I am delighted to be able to announce that IAG will be our new private sector partner in DeliverSK and I look forward to working closely with them over coming months to bring forward our very exciting vision of development and regeneration in South Kesteven. "DeliverSK will enable us to deliver our projects more rapidly and with more commercial thinking, bringing in vital external investment into the district, matched by the power of South Kesteven District Council's land and political vision. "I am absolutely committed to this council playing a very active role in growing the local economy, with all the benefits and opportunities that creates for our residents and local businesses. "As a district council, we have an important role to play in unlocking and delivering key developments and physical regeneration projects across South Kesteven; schemes that will improve residents' quality of life and help stimulate further development and investment by the private sector. "DeliverSK will allow us to take a much more flexible, commercial approach, while ensuring the council can scrutinise and approve any decisions involving council-owned land or projects requiring further council investment." Alison Simpson, CEO of IAG said "We are delighted to have been selected as the DeliverSK partner and look forward to working with South Kesteven District Council, an ambitious and commercially-focused local authority with a clear vision for its economy and its communities." DeliverSK will be a 50:50 joint venture between SKDC and IAG and equal numbers of representatives from both organisations will sit on the DeliverSK board as unpaid directors and both sides will need to agree for a project to be taken forward. Potential projects include medium to large-scale housing developments, including social and affordable homes; office and employment space; retail; leisure facilities and mixed-use regeneration schemes. Detailed business plans will be produced for preferred schemes for approval by the DeliverSK board. Proposals requiring the use of council-owned land or the investment of council money would also be subject to the council's approval processes. 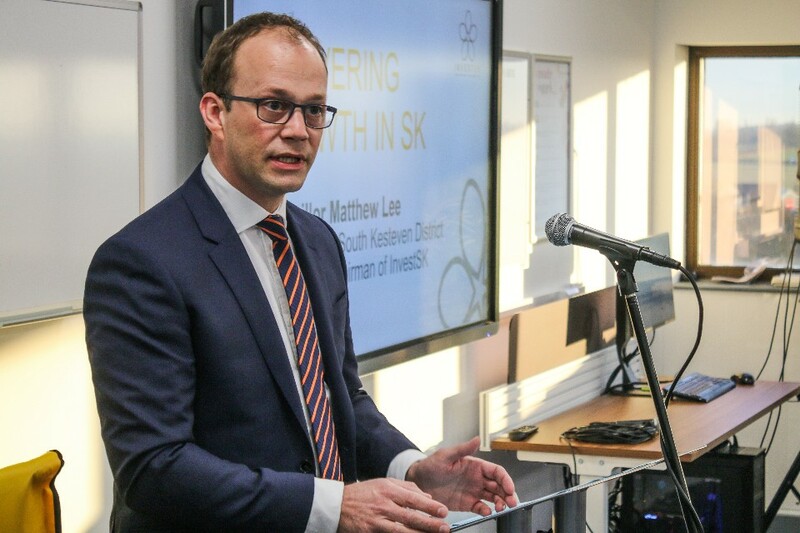 Caption:The Leader of South Kesteven District Council, Councillor Matthew Lee, announces IAG as DeliverSK's private sector partner.